She was born in Thagaste in the year 331. Her family were from the middle classes. The family environment in which she is born into and grows up is one of strong Christian conviction. In Monica we find a strong character. She was always quick to affront the most difficult situations and to respond with a definitive and sober manner; she was to be a woman of few words. 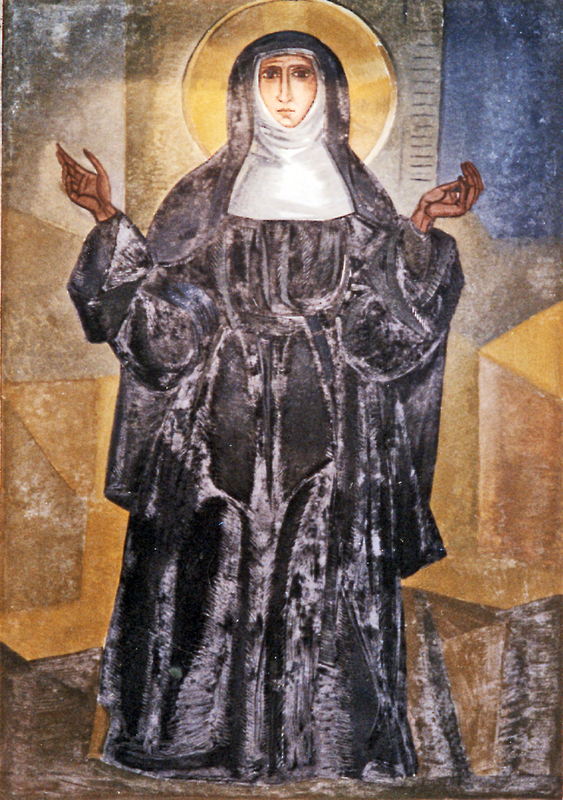 Saint Monica. St. Rita´s Church, Madrid, (Spain). In terms of intellectual formation, Monica did not get beyond the most basic education. In the capital Rome women could get easy access to culture; yet in the provinces they didn´t have this opportunity. Here they were destined to get married and work in the home. Monica married a pagan in Thagaste, Patricio. She dedicated herself to looking after the home. Like every Roman woman, she had the task to look after the necessary purchases, the progress of home tasks and the children…She was responsible for all the interior life of the home. The relationship with Patricio was difficult, but exemplar. Monica lived in a typical male-centred society. It was not infrequent abuse and bad treatment by husbands. Patricio had a very voluble character; he could be very loving but equally infuriated. For this reason she had to exercise with him a heroic amount of patience and prudence. Monica had in mind a great task: the conversion of her husband. Patricio started to prepare himself for baptism when Augustine was 16 years old; and baptized, died in the year 371. She had triumphed in the only possible way, with true love. He ended up loving her, admiring her and accepting her faith. 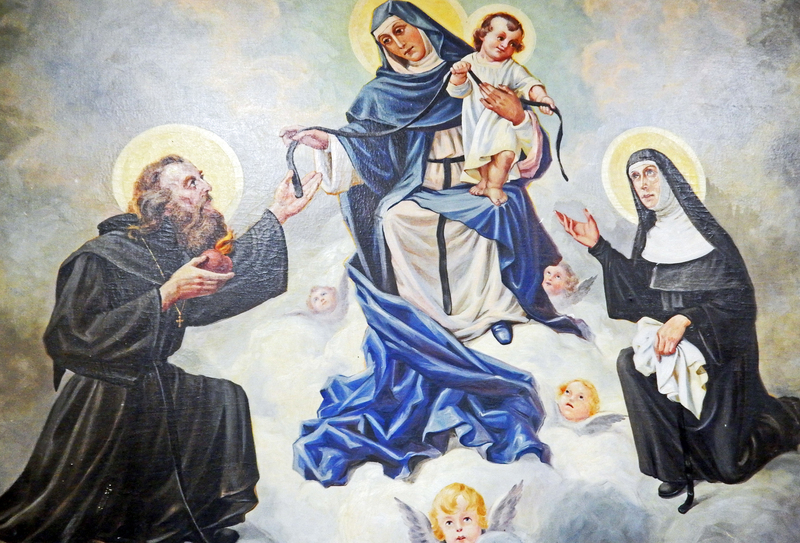 Saint Augustine, Our Lady of Consolation and Saint Monica. Tagaste Monastery, Suffern, New York, United States. Patricio and Monica had, but we do not know in which order, three children: Navigio, a daughter whose name we do not know, and Augustine. Their education, as in every roman family, was the charge of Monica. This converted her in the great catechist of her children. The real Calvary of Monica started when Augustine finished his studies and returned to Carthage from Thagaste. Her son returned home a Manichean. From this moment Monica would not give up until she saw him converted. They were years of tears and intense prayer. She besieged a bishop so that he would talk with him. The bishop had been a disciple of the Manicheans and in a spontaneous way had abandoned them. He said to Monica: Go in peace and live for many years. It is impossible that a son of these tears would be lost. Through everything, Monica always wanted to be at Augustine´s side. When he left to teach in Carthage, she followed him there. There she suffered the most painful experience of her life. Augustine had decided to leave for Rome. Monica wanted to accompany him, but he would not accept. He resorted to a ruse: he told his mother that he had to go to the port to say goodbye to a friend. When she awoke, Monica discovered that Augustine had boarded and left Africa. At the end of the year, Monica also left for Italy. She found Augustine in Milan. He had now abandoned the Manichean sect. Her son would decide not only to be baptized, but also to be a monk. It is the year 386. Monica lived with joy the Pascal Vigil of the year 387. That night her son and her grandson, together with Alipio, Augustine´s friend, would be baptized. Later all of them went to Ostia, the Roman port, and there they stayed waiting for the first boat to Africa. Saint Augustine and Saint Monica, chapel of Our Lady of Consolation. Ceramics by José Luis Sánchez. Church of Saint Rita, Madrid, Spain. One day, in the house, she and Augustine started a conversation about what is to come: both were hungry for God. In a rising scale, they started to taste all beings, admiring everything, and without feeling satisfaction in anything, until arriving to touch a little the region of Wisdom which was not, nor will be but simply is. It is what is known as “the ecstasy of Ostia”. Five days later, Monica became gravely ill. At nine days, surrounded by those whom she loved, happy because God had shown her that he does not abandon those who trust in Him, she died. It was the summer of 387. She was 56. Augustine knew in Carthage a woman who would fill his affective needs for a time. Of her we do not know her name. It seems that she was a Christian, for Augustine gives it as understood that she knew the Church. She lived together with Augustine for twelve years. Her social condition was inferior to that of Augustine, and probably for this reason they never planned to marry: a man of higher social position could not marry a woman of inferior social standing according to the customs of the time. From this affective relationship Adeodatus was born. When Augustine wants to live a more suitable life he tells his lover to leave the relationship. She leaves, promising to never know another man. Terminating this relationship, Augustine had another, more fleeting, whilst he waited the two years that were needed for the coming of age of his promised bride. He would later separate from this other lover, again painfully. Augustine assures us that he was faithful to both women, something uncommon at the time. Born around the year 371, when Augustine, his father, was 17. He died young, in the year 388 or 389. The references that Augustine gives us about his son are in the last stage of his son´s life: he was baptized on the same day as his father, travelled with him to Africa and lived the first years of common life with Augustine. 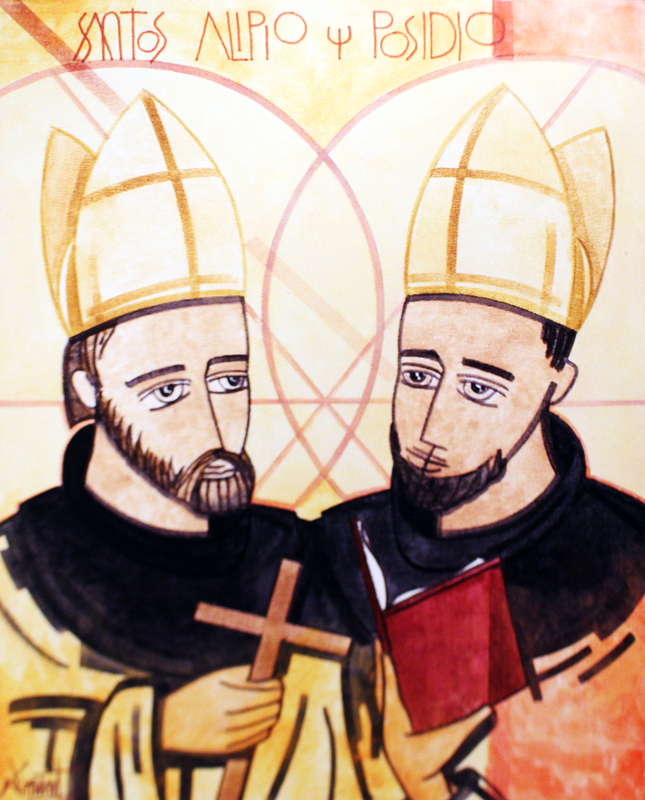 We have a literary work by Augustine, De Magistro, which reproduces a conversation of Augustine and Adeodatus. He was a close friend of Augustine. They got to know each other when Augustine gave him classes as a student. He belonged to an influential, comfortable and rich family which marked his formation. He knew how to relate to the higher classes. We know they had only one moment of separation, when Augustine fell out with the father of Alypius. Alypius was a keen follower of the imperial games, and Augustine managed to free him from this addiction. Alypius was a highly intelligent man. He studied law, converting himself in a very exacting person in his profession, with political talent. He fought against corruption and injustices, up until the point of confronting some Senators and being for this almost pursued. Alypio gave up his post to go to Milan and wanted to dedicate himself to the ideal of Cicero´s Hortensius, with a way of life very similar to Augustine in terms of values and ideology. In truth, he would be successor of his friend as much as in the leadership of the community in Thagaste, as in the defence of catholic values, and will also be chosen as a bishop. Saints Alypius and Possidius. Jaime Dominguez, Mexico. One of Augustine´s disciples, he also came to be a bishop. His writings, especially Vita Augustini and Indiculus are fundamental works in order to know Augustine. The former is the first biography written about the saint. The latter, a catalogue of all the works written by the saint, divided into works, letters and sermons. He knew very well Augustine´s library in Hippo and was always very close to him. Is another of the great friends of Augustine, with whom he exchanged a large number of letters. He was from Carthage and also, like Possidius, was from a rich and socially important family. He met with Augustine when he belonged to the Manichean sect. Nebridius followed the sect, but did not allow himself to be pulled in like Augustine, maybe because of his high intelligence. In truth, he severely criticized Manichaeism and Augustine himself started to doubt the sect because of Nebridius´ influence. He formed with Augustine the first communities for which they had yearned for so much. He was an intrepid investigator, a voracious reader and Augustine took him as the ideal intellectual. He wasn´t baptized with Augustine, but we know he died a Christian. The last news we are offered of him is little before the priestly ordination of Augustine, in the year 391. He was a firm defender of the intimate life of the community, even quite a few times criticizing Augustine for dedicating himself excessively to those who came to the monastery asking for help, his leave-taking etc. He was Augustine´s patron, and his fellow countryman and one of his children, Licentius, will join the community of Casiciaco when Augustine forms it. Romanius was a relative of Alypius and famous for his generosity. He became a Manichean with Augustine, and paid for Augustine´s higher studies in Carthage and he also will relate with him in Milan when goes to resolve matters in the Court. He wanted to participate in the community of Philosophers in Milan, and stayed a Manichean once Augustine was baptized. It seems that he converted at the end of his life, and not in vain for him had been dedicated books like De vera religione and Against the Academics. He was a very cultured Catholic priest, who baptized St. Ambrose and accompanied Augustine before his conversion. He was ordained Bishop of Milan almost at the same time as Augustine in Hippo. He was the owner of the country house in Casiciaco where the community of Augustine started. He was married to a Christian and whilst he always wanted to live in the community he wasn´t able to. Finally, on his deathbed he was baptized. He developed his friendship with Augustine through letters. They never met face to face, though he was an admirer of Augustine. He was born in 353 to an important family in Burdeos. Like Augustine he was baptized by Ambrose after a radical conversion. He was married to a woman called Terencia, but sold all his possessions and retired to Barcelona. In 394 he was ordained a priest and moved to Nola (Italy) to live as a monk by the tomb of St. Felix of Nola. However, during his life he suffered the attacks of Pelagianism and his many letters with Augustine express his doubts over choosing between Augustine and Pelagius. He was the bishop of Carthage whilst Augustine presided over the See of Hippo. They got to know each other in 385 in a return journey from Italy to Africa, when Aurelio was then a Deacon. Between them they contemplated the search for reform in the African Church, Aurelio being the organizer and Augustine the idealist. Both of them together were able in this way to help the African Church to survive the Donatist crisis, bringing all into unity through the Conference of Carthage in 411. The so-called party of Donatus or Donatism appeared in Africa around 305 as a reaction to the defections which had taken place during the last great persecution (303-305). They claimed that the Church was formed of saints, and that sinners had no place in it. It was like the Pharisee in the parable (cf. Lk. 18, 9-14); they started to present God as a judge, continued by putting in doubt his mercy and, in truth, finished by denying the power of God himself to forgive. The consequences were disastrous for African Christianity and the division and bloody persecution which the sect unleashed against the Catholics. At the end, in the year 411, the desired reunification was achieved in the Conference of Carthage. He was a layman sent by the Imperial authorities to preside over the Conference of Carthage in 411. Honorius, the Emperor, had sent him to sanction over and decide who was right, as well as helping the Donatists and the Catholics to put forward their points of view. He judged in favour of the Catholics, but he also from then on had important dealings with Augustine, who was participating in the Conference. Many of the anti-Pelagian works of Augustine were written by order of Marcelino, and to him are dedicated the first books of De Civitate Dei. In the year 413 Mareclino was decapitated along with his brother, both accused of participating in sedition. He was born in the now Portuguese city of Braga between 375 and 380. He got to know Augustine around 414 when he travelled from Hippo desiring to study with him and live in his community. Augustine sent him to Jerusalem so that he would study with St. Jerome and he asked him to write a Universal History which is still conserved today.